Hefty historical data revisions led to a full year growth of 7.0% versus ING’s forecast of 7.1%. 4Q17 also marked a significant sequential slowdown to 0.6% QoQ versus an average quarterly growth rate of 2.0% for the first three quarters of 2017. This was also below our call and the Bloomberg median of 1.2% QoQ. 4Q17 GDP expansion came in at 6.9% YoY based on flash estimates, below the Bloomberg median of 7.3% and our call of 8.1%. Bloomberg consensus for 2017 GDP growth versus the previous year stood at 6.5% YoY. On the demand side, it is likely to see both investments and private consumption softening in the last quarter of 2017. 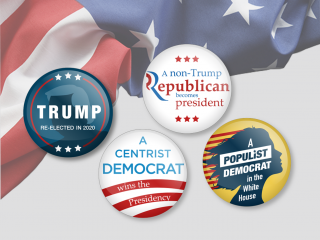 It appears that higher interest rates and inflation, weaker currency and uncertainty about future income due to fiscal changes weighed on the consumer sentiment. 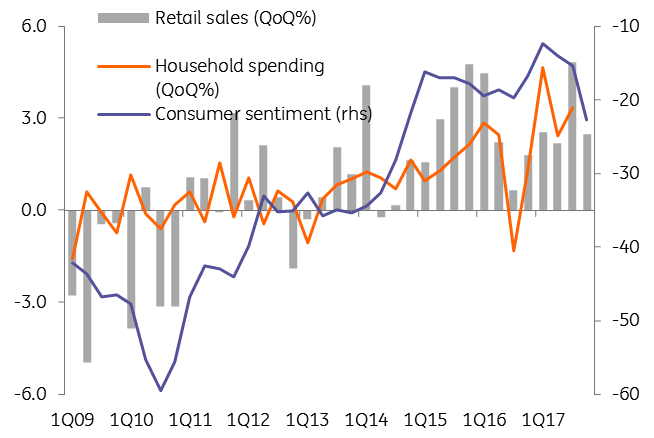 We have noticed that consumer morale had the sharpest QoQ drop in 4Q17 versus since the unfolding of the Great Financial Crisis. While we expected a slowdown as suggested by soft data like Economic Sentiment Index (ESI) and weaker QoQ retail sales, the flash GDP estimate is certainly disappointing even for conservative estimates. 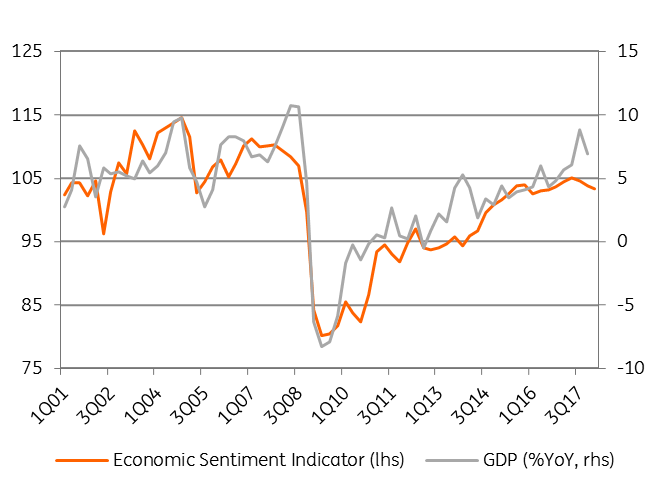 It is even more negative considering the acceleration in industry which had last year the best performance on record and heavy fiscal stimulus in the last quarter. Nevertheless, the fiscal impulse would feed into the economy in 1H18 as 1.7ppt of GDP budget deficit was realised in December alone. 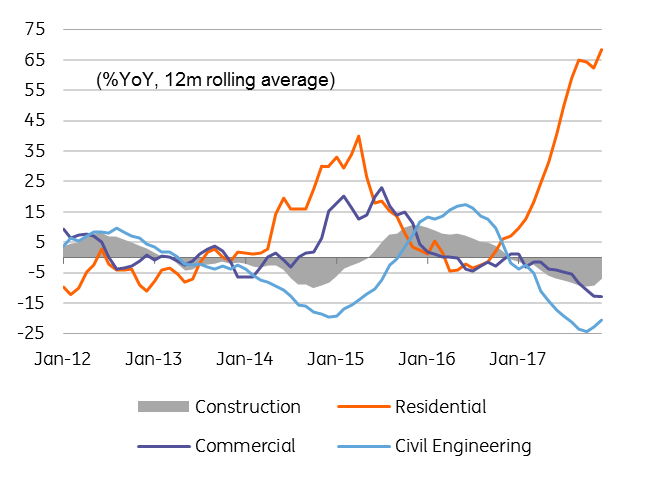 Also, the cut in public investments had a significant impact on construction sector with civil engineering works down 20.4% in 2017 versus 2016. Construction sector contracted by 7.0% in 2017 from the previous year. Hence, except for industry which is relying on external demand the other sectors likely suffered in 4Q17. Government change at the start of the year and suboptimal budget construction based on optimistic assumptions which are likely to lead to further cuts from investments to reach the deficit target means that there is limited room from fiscal policy to prop up growth in case of a slowdown. 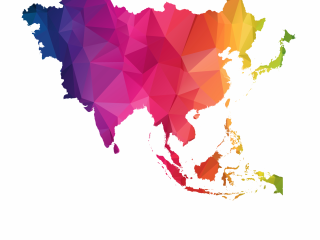 This means downside risks to 2018 growth outlook. For 2018 we forecast 4.7% year-on-year GDP growth vs 4.1% Bloomberg median vs 5.5% the assumption in the budget bill and official forecast of 6.1%. Our outlook for CPI is 4.3% YoY on average for 2018. 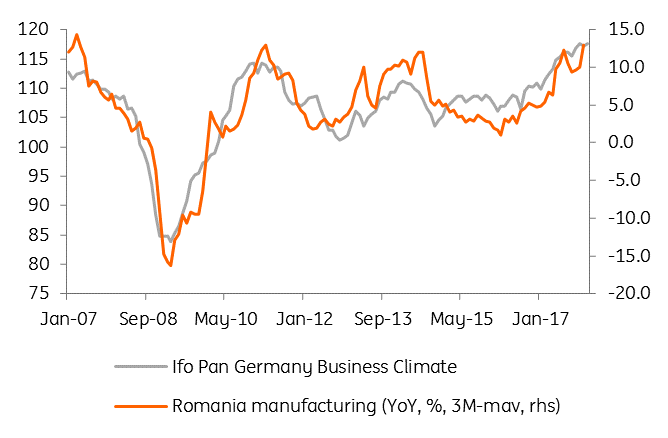 Add today's weaker GDP numbers and above consensus inflation to the mix, and it seems 'Goldilocks' is over for the Romanian economy.